SUPERB J235IP JACUZZI® HOT TUB BUNDLE, JUST £8,499! Finance Available over 5 years at 4.9% APR with a £2000 deposit, 60 monthly payments x £122.99 per month. Subject to status. *Finance Example: J335, priced at £10,749, minimum deposit of £4,000, 36 monthly payments of £187.47 per month. Outstanding balance £6,749. Price includes standard delivery, installation, steps and cover lifter. *With £100 deposit required and payments deferred for 12 months from date of delivery, after 12 months the original balance can be settled interest free +£29 exit fee. If not settled fixed interest at 19.9% APR will be applied for 120 months. Subject to status. *Offer available on selected J300, J400 & J500 models. Subject to terms and conditions. Helping you find the hot tub that’s perfect for you is our pleasure. For over a decade we’ve been helping people discover the benefits of Jacuzzi® hydrotherapy. There is no greater feeling then relaxing into their warm waters and we want all our customers to feel relaxed in our company too. 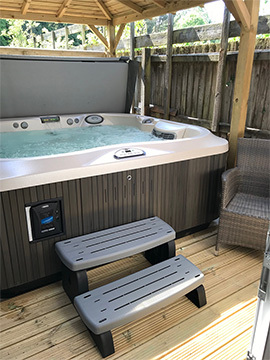 So come into one of our showrooms and you’ll be welcomed by our friendly staff who will take the time to understand your requirements and guide you through our range of hot tubs in an open and informative way. You’ll find no pressure, no pushiness, just a desire for you to find the perfect hot tub. 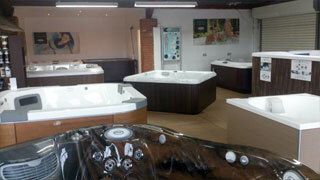 We’re easy to find, easy to get on with and most importantly we make buying your hot tub easy. For over 40 years we have put customers, their gardens and their homes at the centre of everything we do as a company. This drive to sell the best quality outdoor equipment is one that we still have today and it constantly keeps us looking for new ways to keep our customers happy. This vision has really come to fruition though our partnership with Jacuzzi®… where we have made even greater leaps into helping people transform the green spaces around their home. Since the sale of our first hot tub in 2003 we haven’t looked back. Over the following years we have carried out over 1000 installations, using every new fit to enhance our knowledge and experience. All this has led to us becoming one of the UK’s leading Jacuzzi® dealers, so our customers can be assured of excellence, efficiency and professionalism every time they buy from us. To really experience the Jacuzzi® difference, you should come along to either of our showrooms and wet test our hot tubs in person. You’ll step out of our private changing rooms, wearing one of our exclusive robes and then relax into the cleanest water and its optimum temperature. These wet tests allow you to try every seat & lounger configuration in your own time, immerse yourself in a hydrotherapy session with jets unlike any other and help you choose your model in the most stress-free way. For those of you near our Bristol Showroom you can choose to use our new, luxury wet test area through the day – and for customers of our Swindon showroom, we provide evening wet tests. Call us today to book a time that suits you. This is quality by appointment & discovery through luxury….